Part of my job that I really love is going to the small towns of Eastern Colorado. Monday we got on the road for Burlington. We always stay at the Comfort Inn in Burlington. The staff is very nice there. I left my phone cord somewhere between my house where I unplugged it and my office when we left for the trip. So I went to the front desk, and she dug through the lost and found phone cords, and loaned me one for my phone for the night. Just across from the Comfort Inn is The Route steakhouse. I had pretty much decided to get a steak, but when they had fried chicken for a special, I was tempted. But the waitress said the steak was better, so I went with that. I meant to order it with the goat cheese but forgot. I had the baked sweet potato and a salad as my sides. 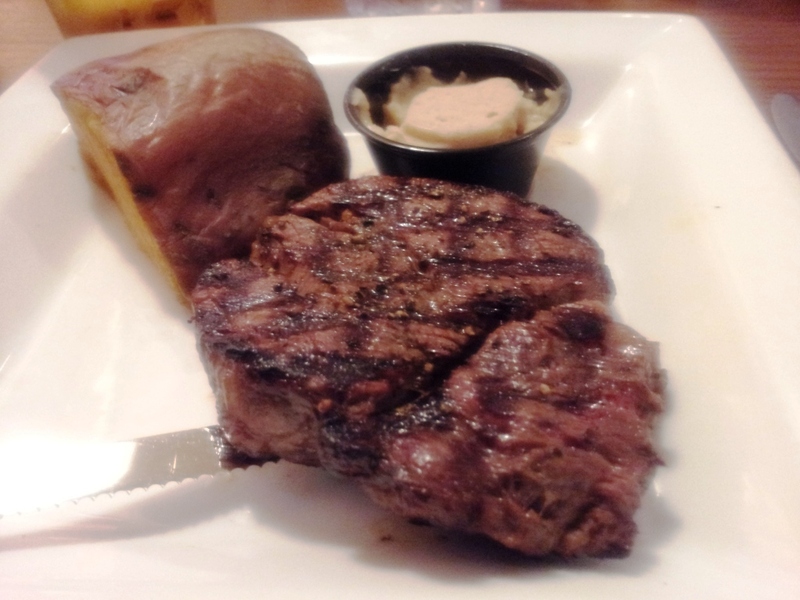 This was excellent, maybe not the most prime filet I have ever had, but worth the cost and very tasty. The sweet potato was good too. I was in a beer mood (rare) and had New Belgium Brewery’s seasonal special Somersault Ale, which I quite liked. I will have to try it in a bottle to see if I like it that way, or just on tap. Then I went back to the hotel and fished around in my FreedomBag (awesome product, I am on my 2nd one, would not travel without it, great gift to give people who travel) and accidentally found my razor, which you should put in one of the clear pockets, not one of the dark side pockets. So then I played “stop the bleeding” for a while. Tuesday morning was a breakfast meeting at the American Legion Post – aka The Post Bar and Grille. They have quite a good restaurant there. 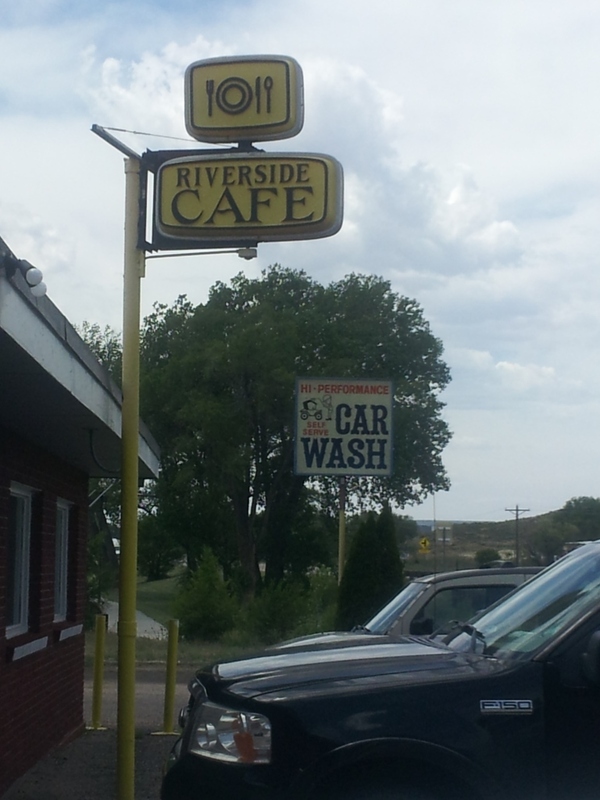 They also have calf fries occasionally for a lunch special, if you are interested in those. (See also: Rocky Mountain Oysters.) I was going to try them for the sake of trying new things, but they did not have them available for breakfast. Our next meeting was in Yuma. It must be a good year for yucca plants, as we saw more of them than usual on the drive from Burlington to Yuma. There was one hillside that was totally covered with plants, all in bloom. Yucca, also known as Soap Root, is a big spiny plant that grows in poor rocky soil. I have tried to dig one up at the ranch, but it was hard to get much of the tap root, which can be quite long, and it didn’t survive being transplanted. This year I have five or six of them that I started from seed. They are just little spikes right now. I need to do more research on how long I should raise them in pots and when they can be planted outside. I have a spot planned for one, but not for five, so it will be OK if they don’t all make it, I am not sure what the attrition rate will be. 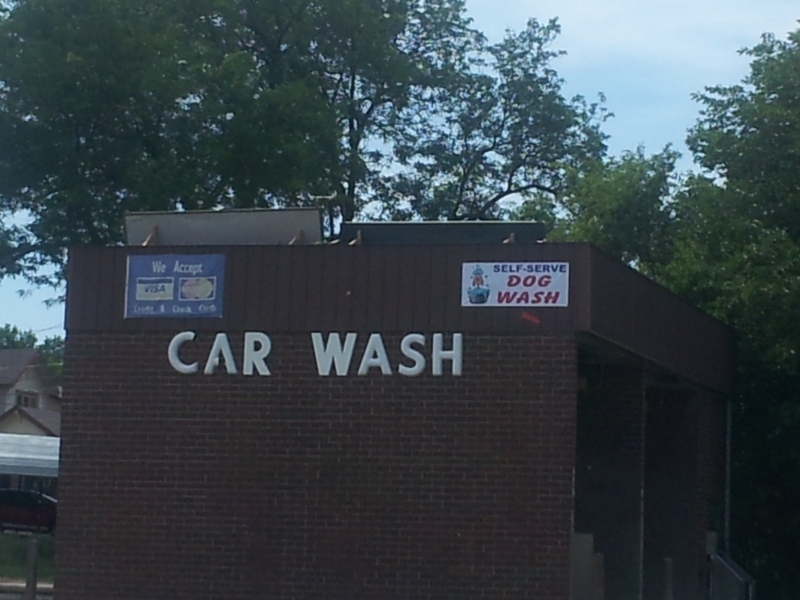 I did not know that self-serve dog wash was an alternate use for car wash. Value added opportunity! I like the older signs that are still in place. They have more character. What do you order in a cafe like this? 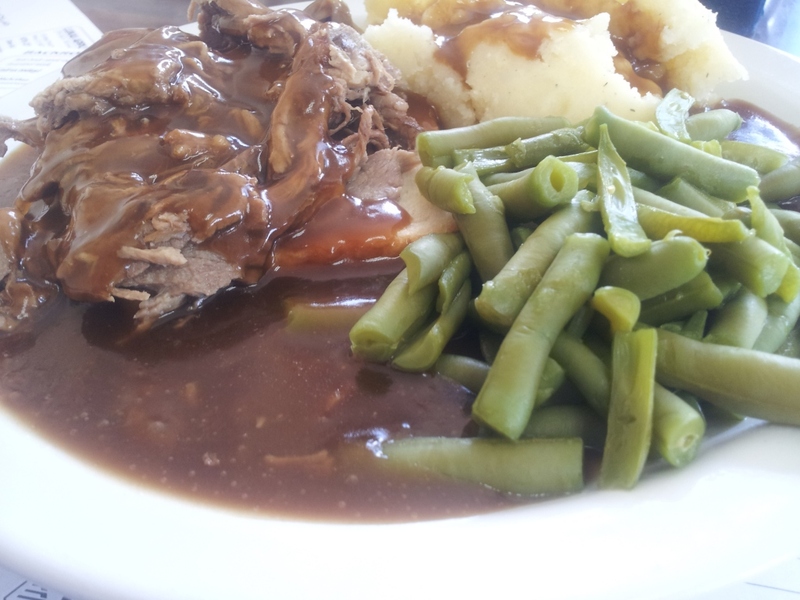 You order the hot beef sandwich, of course. My recommendation on how to choose a restaurant in a small town (or almost anywhere for that matter) – if the parking lot is full of pickups and Buicks, that is a good sign. 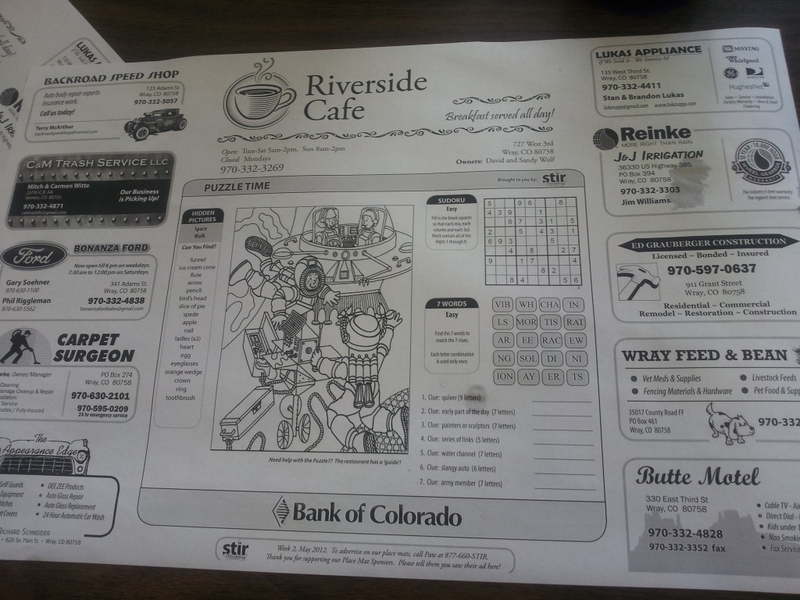 Also a good sign: personalized placemats with local advertising. I was embroidering on the bunny block as we drove along, and so I missed the turkey buzzards on the side of the road. Sad. I always like to see the local turkey buzzards. I am very excited to go on vacation to the Great Sand Dunes, Santa Fe, and Albuquerque, but I feel woefully underplanned. Usually I like to have vacations planned down to the minute. Apparently I will have to hang loose and relax on this one. Or plan in the car which Ken is driving….. This entry was posted in Colorful Colorado, Restaurant reviews by glenderella. Bookmark the permalink. One of the car washes in town here has a self-serve pet wash. They even provide skunk odor remover. I don’t know if I would ever be up for calf fries, let alone for breakfast. 😉 Blech. That steak does look good. Maybe I know what I’m having for dinner tonight!